Dr. Marie Dellas,’70 PhD (GSE) and ’67 MS (CAS), in order to pay tribute to her parents, Theodore A. and Katherine C. Dellas, has created a $4,000 scholarship to be awarded to an Honors Scholar matriculated in the Department of Biological Sciences and pursing a Bachelor of Science degree program or the Bachelor of Science in Bioinformatics and Computational Biology degree program. Creative thinking and behavior have always interested Dr. Dellas since she was a graduate student working towards her PhD at UB. Dr. Dellas’ intention when creating this scholarship was to reward students who practice and apply creative thinking. The scholarship will enable the recipients to continue their education and perhaps address new concepts or ideas in the biological area that may eventually lead to outcomes beneficial to society. The recipient must be a junior or senior majoring in Biological Sciences or Bioinformatics and Computational Biology. The recipient must also be a US citizen and preference will be given to a student of Greek descent. Preference will also be given to a student working on an innovative and novel research project. Candidates must submit three letters of recommendation. Applicants must also include an original essay in support of their expertise or knowledge and how they aspire to make an impact in that particular substantive area. The essay should describe the student’s goals and how they may expect to contribute to their chosen field in a substantive way and cite relevant or specific examples of situations in which the recipient succeeded in reaching a significant goal(s) in the past. This scholarship may be renewable for a junior awardee if the recipient meets all the above mentioned criteria. All submissions must be in electronic format, preferably Microsoft Word documents and/or PDF files. Deadline for applications is Friday, April 13, 2018. Applications and letters of recommendation with the scholarship name included in the subject line should be emailed to: honors@buffalo.edu. The application deadline was March 1st but I can extend it a few weeks because we need more males J Here is what you can send: Thanks! The role of a MDA summer camp volunteer is a very important one, and if accepted, many people will be counting on you to do your very best to take care of MDA campers and uphold MDA’s policies and reputation. You would be applying to attend MDA Summer Camp as a volunteer counselor for the week of Saturday, June 24 – Friday, June 30, 2017. The Western NY MDA summer camp is held at The Rochester Rotary Sunshine Campus located in Rush, New York. The MDA summer camp volunteer process includes a completed camp application, an interview in your local area with a MDA staff member, three verified references, a criminal background check, and a completed physical examination by your medical professional within the past 12 months. The deadline to complete the application is March 18, 2017. To start the application process, copy and paste this URL link into your browser to get started. The Muscular Dystrophy Association has been assisting individuals with neuromuscular diseases “live unlimited” since 1955 by providing an unforgettable weeklong summer camp at no cost to their family and no cost to our volunteers. We are excited that you want to be a part of this wonderful opportunity. It is a life-changing experience for campers and counselors alike. Thank you for helping make MDA Summer Camp “The Best Week of the Year”! Honors graduating seniors are invited to submit an application for the Christopher Peterson Commitment to Service award, which is bestowed annually upon a graduating Honors Scholar who, by devoting their time, talents, and expertise to serving the public good, has made significant, demonstrable, and direct contributions to the community. Christopher Peterson was a junior civil engineering major in the Honors College who tragically lost his life in a car accident in 2013. Through his enthusiastic participation in Greiner SIH and his many other volunteer endeavors Chris embodied the Honors College spirit of service. The intent of this award is to recognize a student who exemplifies a similar commitment to community service. The awardee will receive a $750 award as well as $250 donated to the community organization of their choice. Are available to attend the Honors commencement ceremony on Friday, May 19, 2017. 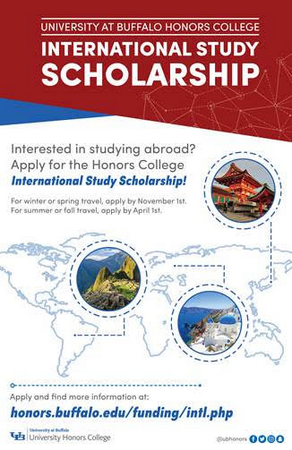 Application packets may be submitted to the University Honors College Office in 106 Capen Hall or electronically to honors@buffalo.edu by no later than 4:00 p.m. on April 3, 2017. If you have any questions contact Dr. Tara Jabbaar-Gyambrah at jabbaar@buffalo.edu We look forward to receiving your applications. To help you prepare a competitive application UB will be hosting a series of Fulbright workshops this spring. Students will learn more about Fulbright, how to select the country to which they’ll apply and how to propose the required cross-cultural engagement project. These sessions will be hosted by the Office of Fellowships and Scholarships and UB’s Fulbright Program Advisor, Dr. Colleen Culleton. Sessions will be held on Wednesdays: February 8th, February 22nd, March 8th and March 29th. The sessions will be offered from either 9:00am-10:00am or 3:00pm-4:00pm on each of these days. Students are required to commit to all 4 sessions which includes beginning preparation of the personal statement and project proposal. To be considered for this program, students must complete the online application by 5pm EST on Monday, January 30th: https://universityatbuffalo-wgtck.formstack.com/forms/fulbright_development_program_for_juniors. Are you interested in studying abroad but need funding? Download your application today on the Honors College website and submit your application materials by November 1, 2016 at 4:30 p.m. to 106 Capen Hall. Play UB Trivia Games and Win Prizes! Create your own pathway to academic and professional success! Sponsored by CSTEP, CURCA, LSAMP, McNair Scholars, UB Academies, UB Libraries, UB Scholarships and Fellowships, UB School of Engineering and Applied Sciences, University Honors College, Undergraduate Student Association and Women in Science & Engineering. oncology focus. The award amount is $1,000.00. their contribution to the cure for cancer. research field (preferably with an oncology focus). succeeded in reaching a significant goal(s) in the past. papers they may have written or letters of recommendation. The Award is a one-time grant of $1,000.00 and is non-renewable. The Honors College at honors.buffalo.edu.